It’s estimated that over 1,000 people die each day from complications related to having high blood pressure. 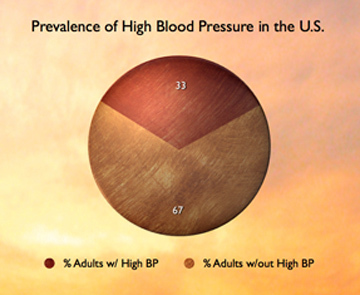 Of all the people in the United States who have high blood pressure, only about half have it under control. Half of those who don't have it under control are taking medications, but they aren't working. 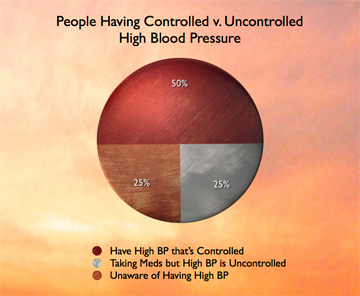 The other half of those who don't have it under control aren't aware of the fact that they have high blood pressure. Among those who have their blood pressure under control with the use of medication, many suffer from unpleasant side effects such as nausea, headaches, dizziness, impotence, and fatigue, as a result of the medication. How Do You Reduce Blood Pressure? 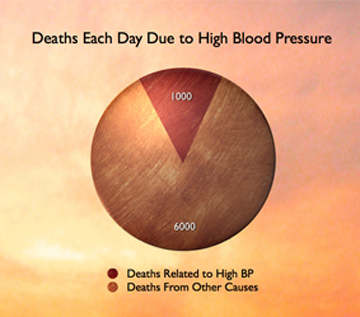 High blood pressure constitutes a serious and potentially life-threatening epidemic. Isn’t there anything that can be done to effectively lower blood pressure – without debilitating side effects? Research shows that if people did just a few of these things – such as losing weight, exercising more, eating healthier food, reducing salt intake – each year we might save over 100 billion dollars in health care costs nationally, and have over 300,000 fewer deaths. If We Know What Works, Why Don’t We Do It? The majority of doctors interviewed say that they've given up recommending lifestyle changes because they've learned from experience that people won't make those kind of changes. And even our doctors do tell us, the fact is we do find it difficult making lifestyle changes, and may be more inclined to pop a pill. But even if we’d like to do something other than take medication, the list of possibilities can be overwhelming and very off-putting. What makes it even more confusing is that there’s more to it than just implementing the right habits. People have high blood pressure for many different reasons, and so it’s up to each person to find the remedy or remedies that are right for them. Dr. Mimi Guarneri, a medical doctor who practices integrative medicine, tells about a patient who came to her with high blood pressure after seeing six other physicians, each of whom prescribed a different medication. By the time he came to her he was taking multiple medications with no reduction in his blood pressure. As was her habit, she sat him down and asked him to describe his day to her – what he ate, what he did, how he felt, etc. At one point, he mentioned that he was in the habit of drinking bottled water with added electrolytes – about eight bottles a day. Dr. Guarneri stopped him right there, advising that he immediately stop drinking the electrolyte-enriched water (which has added sodium) and come back to see her in two weeks. When he returned two weeks later, his blood pressure was normal. We know salt can have a powerful effect on blood pressure. But there’s a catch – the benefit of reducing salt intake applies only to people who are “salt-sensitive.” And many people are not “salt sensitive.” They can eat salt without raising their blood pressure - in fact, if they were to reduce their salt intake by too much, it could actually lead to other kinds of health problems. Another source of confusion has to do with the relationship between stress and high blood pressure. Researchers have been arguing about that relationship for years and there is still no consensus. K.C. was a married, 35 year-old father of two who suffered from severe headaches and blood pressure that was so high it was considered to be life-threatening. His health insurance company had paid out more than $2,000,000 in treatment over a period of three years. He had been examined at three major medical centers more than 20 times, and had numerous tests performed to determine the cause of his problems, but all of the tests had come out negative. And throughout his three years of treatment, K.C. insisted he had never experienced any significant distress or trauma with regard to home, work, or social relationships. Before the onset of his symptoms, K.C. had been an excellent student, a leader in college, and a very successful salesman who was on the fast track to a top executive position with a major national corporation. But as a result of his symptoms, he had become, in his own words, an “invalid,” barely able to perform simple housekeeping and child-care activities. The turning point for him was a series of biofeedback sessions with a psychologist specializing in psychosomatic conditions. With K.C. hooked up to various biofeedback devices, the psychologist looked for spikes in the readings that would indicate stress. The highest spikes occurred when K.C. talked about his relationship with his wife. During the course of the biofeedback treatment, he came to realize that he had been harboring a great deal of intense anger toward his wife that he was completely unaware of. With that recognition, his blood pressure dropped down to normal – without the use of any medications or other treatment apart from the biofeedback – and his headaches stopped altogether. By now, you may be wondering what all this has to do with the theme of this site – remembering to breathe. Well, what is it that can help you sort through the long lists of possible remedies and help you figure out which one(s) are right for you? How can you know whether your high blood pressure is being caused not by physical things but by “hidden emotions” when, by definition, they’re hidden from you? Ultimately, it involves developing your mid-prefrontal cortex, your MPFC – the part of your brain that’s responsible for, among other things, your level of self-awareness and your capacity for self-regulation. It’s a little trickier when it comes to finding the right physical remedies (diet, exercise, etc.) because many people don’t experience any symptoms related to their high blood pressure. However, with a well-developed MPFC, you’ll have the discipline and the clarity it takes to try different things and keep track of which ones make a difference. So by “remembering to breathe” – that is, by using the techniques on this site to help you activate your MPFC and give you access to the core experience of calm, clarity, ease, and contentment - and by getting the support you need to do integrate these practices into your life, it will be so much easier to make the lifestyle changes that will help you reduce your blood pressure. And by the way, using the heart-centering techniques to develop your heart intelligence, or simply evoking the qualities of the core, are both effective ways of lowering blood pressure. It was in 2004, during a routine visit to my doctor, that I discovered I had a dangerously high blood pressure of 160/100. In the first three months after discovering it, I lost 25 pounds, developed a regular exercise routine designed to reduce blood pressure, and did many other things as well. Between 2004 and 2007, I tried five different kinds of medication, four stalks of celery a day, at least three different breathing exercises, two different yoga routines, calcium, potassium, and magnesium supplements, and lots more. Fortunately (very fortunately), nothing bad happened. In fact, my blood pressure dropped within a day, to an average of about 138 over 87, and stayed in that range for the next year. One year later, thinking I needed to get it still lower (normal is 115/75 to 120/80), I started on medication again. Within two months, I was in the emergency room with a blood pressure reading of 190/120, and eight months later, ended up again in the emergency room, with a reading of 230/130.